The Bamboohouse is centrally located in Riazzino (Tessin, Switzerland). Tenero is about 3 km away. The bicycle path Bellinzona - Locarno - Ascona passes close by. Bicycle garages on site. Ideal for walks to the Verzasca valley, for boat roundtrips (Brissago islands), city sightseeing and outings. Generous resort, set on 8000 m2 grounds, surrounded by lavish green (palmtrees, bamboo). Up to 75 beds in 3 different buildings can be flexibly combined. For 40 years we have accommodated all kinds of groups and associations. Families with children feel most comfortable with us as well. Unfortunately our residence is not equipped for the severely handicapped. 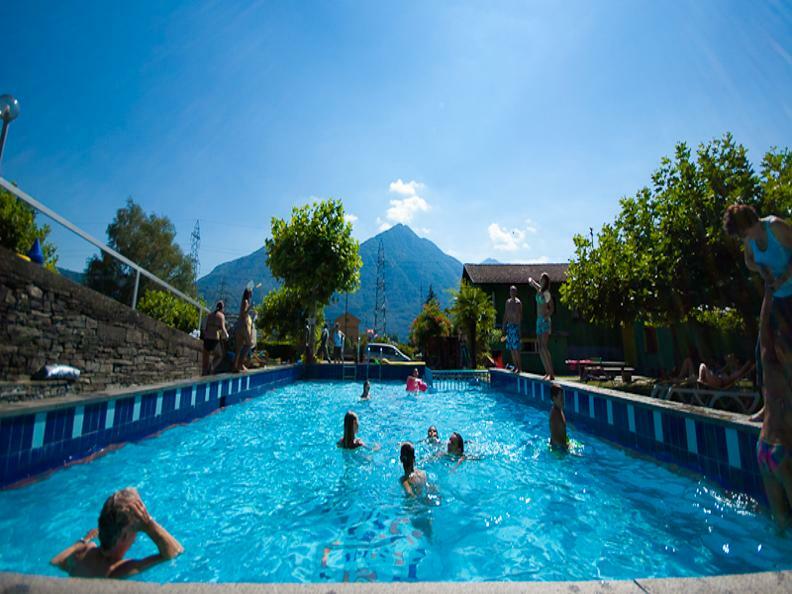 Own private swimming-pool , roto-golf, table tennis, volley-ball, children's playground, table football, big playground,Billiards and a Rustic-style international restaurant with separate grottino. Train (SBB) and post-bus to Locarno, Bellinzona and Lugano on an hourly basis. Price per person in dormitory accommodation: CHF 30 - 45.